Tiny (“pocket”) monsters hiding in the urban environment really do exist. They are called insects. So pick up a camera and try to “photograph them all,” get involved with Bugs In Our Backyard, or do something else in a similar vein. All images used under Creative Commons license (CC BY-NC-ND). Click images to zoom and/or read more about these lovely pictures, and check out the other 2016 winners. The Museum of Science, Boston has an interesting citizen science project running – their Firefly Watch. Anybody can register and add observations of fireflies in their local area. The project has been running since 2008, and has accumulated over 30,000 observations so far (mostly from the US – see map above), which are available online. The graph below shows the result of fitting a family of Gaussian “bell curves” to the data. 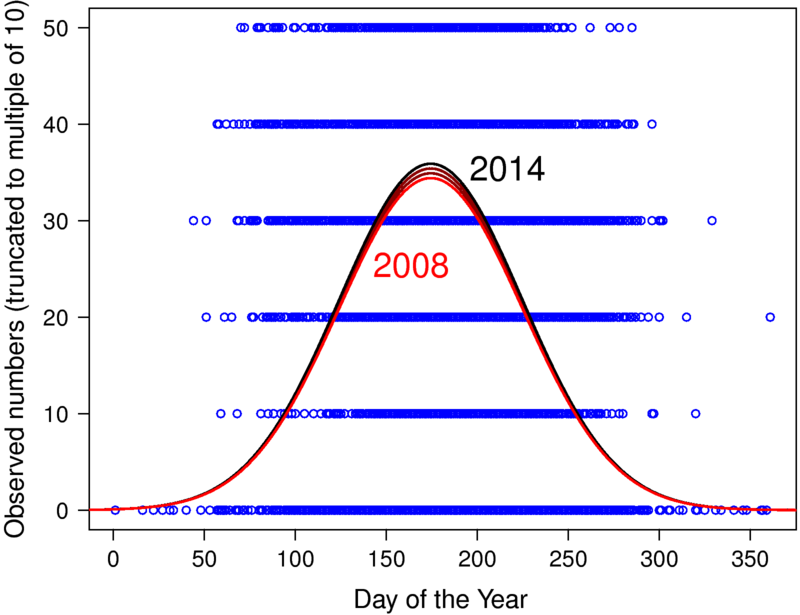 Observed firefly numbers peaked around June 23 each year (day 174 when it’s not a leap year), with a slight increase in the height of the peak over time. There seems to be no significant change to the timing of the peak. Recently I took my own advice and visited the island nation of Vanuatu. I had a great time! 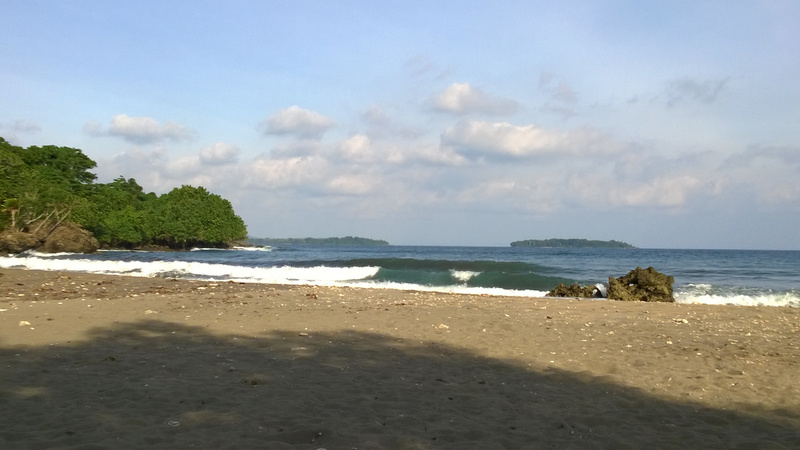 Since the islands are volcanic and surrounded by coral reefs, the beach sand ranges from pure white to basaltic black, with an intermediate grey-brown in some cases, like the beach in my photo above. Vanuatu has a range of interesting wildlife (though no native land mammals other than bats). Birds of Vanuatu include the Vanuatu kingfisher (Todiramphus farquhari, above), which I did not see. There are 120 other bird species, including visiting seabirds. Butterflies of Vanuatu (of which I saw many) include the Monarch butterfly (Danaus plexippus) and several subspecies of the Canopus Swallowtail (Papilio fuscus, below). The 2007 book Animal Architects: Building and the Evolution of Intelligence by James L. Gould and Carol Grant Gould explores structures built by animals – nests, cocoons, spiderwebs, beaver dams, and the like. This is an extremely interesting topic, and so I read this book with great interest. Animal Architects is very readable, and provides good information on spiders and insects – especially social insects like wasps, ants, bees, and termites. There is also an extensive discussion of how birds build nests and bowers. I found the discussion of bird nests particularly interesting – especially the way in which construction style was linked to taxonomy (p. 181). The authors are based in Princeton, New Jersey, but there is a surprisingly large number of references to Australian wildlife (about a dozen mentions). Perhaps this reflects the interesting range of birds and insects living in Australia. Well-known animal architects like the beaver help to round out the overall story. However, four things annoyed me about this book. First, there are readings for each chapter, but no specific endnotes. Second, there seemed to be considerable speculation, as to the cognitive mechanisms that might be involved, without any actual evidence being cited. Third, there was no reference to simulation studies. In many cases, the only way to tell whether simple programmed rules can generate observed behaviour is to program the rules and try it out. The results can be surprising at times (for example, bacteria can home in on chemical concentration gradients, in spite of not being able to sense the direction of such gradients, and not being able to steer). And fourth, some statements seemed rather debatable. For example, many biologists would disagree with the claim that “the [wasp] builder needs to know where she is in the overall structure under construction, and what needs to be built there” (p. 88) – arguing instead for stigmergy as the key mechanism. There is also the rather odd statement that “human speech has fewer than three dozen consonants” (p. 273). In fact, there are more than this just in Hindi, and far more in the IPA. See here and here for other reviews of the book. Metaeuchromius glacialis is a recently described moth found in a glacial area of Tibet. The photograph above is from the ZooKeys paper by Weichun Li and Dong Liu. The white and grey colouration of this moth is clearly camouflage suited to the ice and rocks of its glacial home. I recently read, somewhat belatedly, Endless Forms Most Beautiful by evolutionary developmental biology pioneer Sean B. Carroll (the title derives from a line in On the Origin of Species: “from so simple a beginning endless forms most beautiful and most wonderful have been, and are being, evolved”). This well-written book provides an excellent explanation for how a toolkit of genes like the Hox genes (see image below) control embryonic development in animals. The discovery of these genes shows that fruit flies, starfish, and people are more closely related than was once believed. These genes work by producing proteins which in turn control the expression of other genes, in what is effectively a kind of computer program that can be visualised (and Endless Forms Most Beautiful contains several lovely colour plates which confirm this). Carroll concludes with a plea for teaching more evolutionary biology in schools. Personally, I think a greater priority would be an increased emphasis on teaching ecology, given the serious consequences which human activities (even well-meaning ones) can have for the planet. However, that quibble does not stop me from recommending this book to anyone who has not read it yet.